When I woke up this morning, groggily fumbling the light on and attempting to brew my first cup of coffee, I did not expect to type a headline today that included a scientific study, cheese, and A Tribe Called Quest. This unpredictability, though, is one of the great joys of being a reporter, and so here I am, relaying to you the “news” of a Swiss study that concluded Emmental cheese wheels love themselves some funky hip-hop beats. That information comes courtesy of Reuters, a globally respected news service that nonetheless could not resist covering this story as an excuse to make a novelty cheese headline. I know, the temptation is real. Reuters filed the article under its Oddly Enough category, much as the Associated Press has an Oddities section. Why, exactly, is this Swiss study so odd? 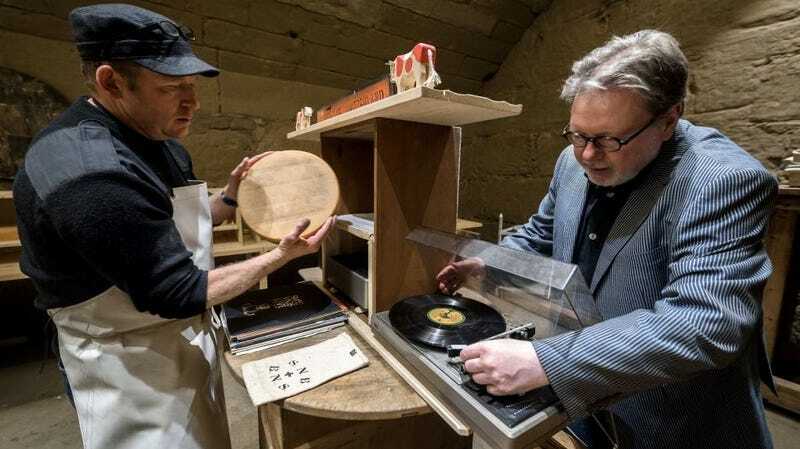 Because in the experiment, researchers from the Bern University of Arts hooked up a bunch of Emmental cheese wheels to transmitters that various genres of piped music into the dairy products, then fed those wheels to a cheese “jury” to determine whether the music had any effects on the cheeses’ texture or flavor. Some cheese listened to Led Zeppelin’s Stairway To Heaven, some listened to Mozart’s Magic Flute, some listened to Vril’s UV, some to Yello’s Monolith, and still other cheese listened to A Tribe Called Quest’s We Got It From Here. Which of those cheeses liked what they curd? The ones that listened to Tribe, obviously. According to the researchers, a jury of blind taste-testers found marked differences in the smell, flavor, and taste of the hip-hop cheese. They hypothesize it has to do with the specific frequency of the music. “All the energy is directly resonating inside of the cheese,” Michael Harenberg of Bern University of Arts told Reuters in a quote that sounds like something from a Cheech & Chong Do Science! special. The energy, you see, is resonating inside of the cheese. Please read my sarcasm as appropriate skepticism toward a study that was conducted on an unspecified number of cheese wheels and judged by a bunch of fallible humans. Though I’m not dismissing these results entirely—after all, if sound waves can age whisky, why not cheese?